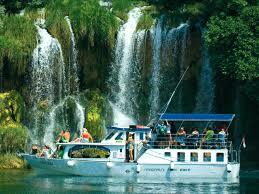 Gecko tours is the leading supplier of small, fully guided tours to Krka from Split. As always, you can have a fully guided tour of Krka waterfalls or just chill out and do your own thing or even a bit of both… Our price includes the park entrance fee and thereby avoids the long line to the park in Summer which is really unpleasant on hot summer days – don’t be fooled by other operators who do not include the entrance price in their offer!! 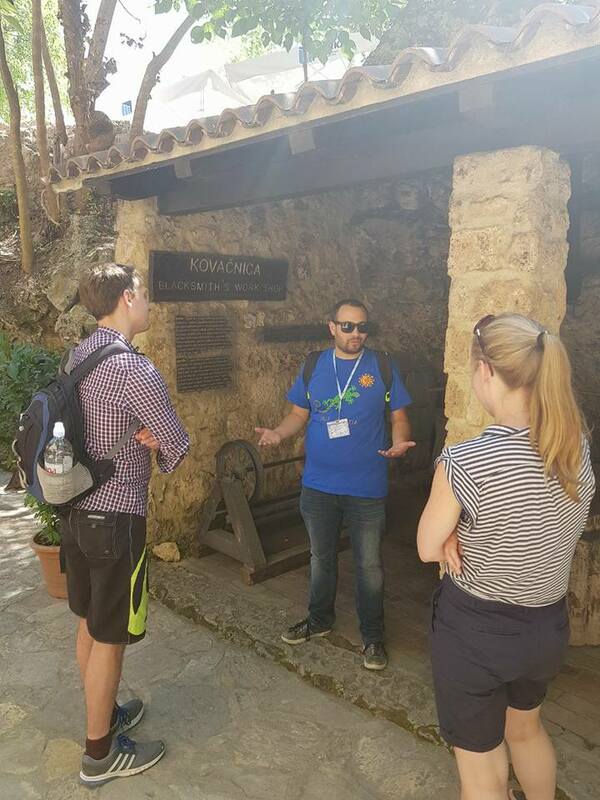 Please take a look at our Trip Advisor rating Trip Advisorif you are in any doubt of how good this tour to Krka waterfalls with us really is!! Extending along the 73km River Krka, the Krka National Park runs from the Adriatic near Šibenik inland to the mountains of the Croatian interior. It’s a magical place of waterfalls and gorges, with the river gushing through a karstic canyon, 200m deep. Sights built by humans are also a major draw of the region, the area’s remoteness attracting monks who constructed their monasteries here, the Skradinski Buk waterfalls are a collection of 17 waterfalls that range in height by over 45 meters. It is characterized by exceptionally rich and varied flora and fauna. You will see many different bird species (there are over 200), and possibly some of the 18 different species of bat who call the Park their home! Eighteen species of fish inhabit the Krka River, among which ten are endemic, making the Krka a natural landmark of the highest category. Brown trout and Dalmatian barbelgudgeon are a couple of fish that can be found in the ecosystem. 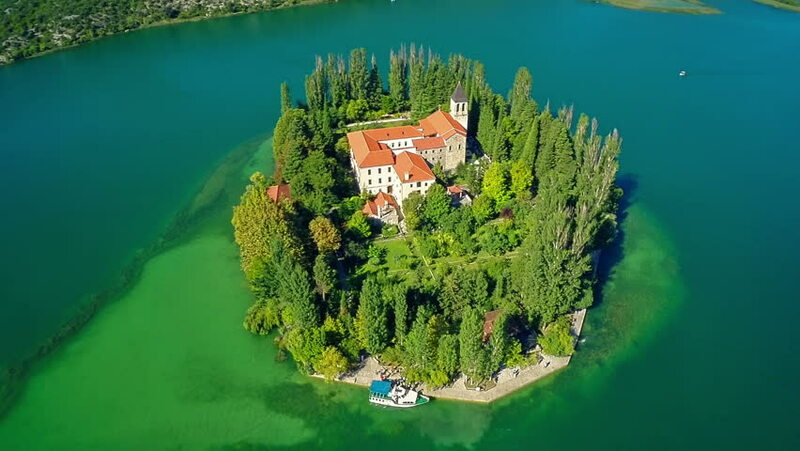 About 6km upstream from Skradin, the tiny island of Visovac in the Krka river was settled by Franciscan monks in 1445, who originally built a monastery in that year (later demolished, then rebuilt in the 18th century) and a church in 1576. I would venture to say that it may be the world’s most stunningly located monastery. The austere walls and towering bell tower are protected by a circle of cypresses that point to the sky like swords. Beyond the tiny island lies the trout-filled waters of the lake which, in turn, is protected by high karstic cliffs. The effect is magical. From the 16th to 19th centuries, the monastery amassed a rich collection of paintings, relics and folk costumes. Don’t miss the rare illustrated copy of Aesop’s fables which was printed in 1487. It’s one of only three in the world. The monastery’s treasures are exhibited in a small museum and outside is a lovely, flowering garden attended by the 10 monks in residence. Roski Slap (slap being Croatian for waterfall…) is another famous sight within Krka National Park. 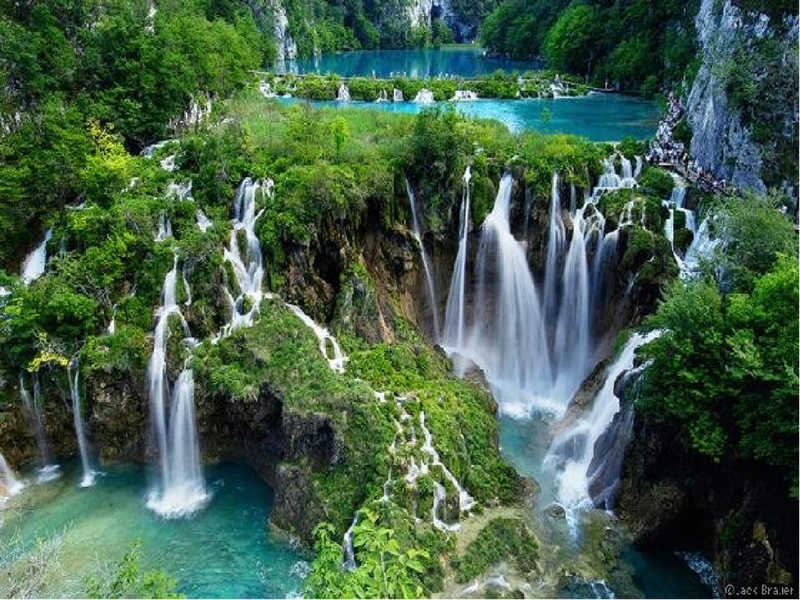 A series of 12 waterfalls in a space of 450 metres, the largest is just over 22 metres in height and 60 meters in width. Undoubtedly, one of the best way of seeing the sights of Krka waterfalls is with a boat excursion – a number of these leave from Skradin. This will allow you to enjoy the beauty of the Park up close and in a relaxed manner. The remains of the former hydroelectric plant “Krka” are located at Skradinski Buk. Ante Šupuk (1838 – 1904) was a Croatian engineer and inventor, he was also also the mayor of Šibenik. 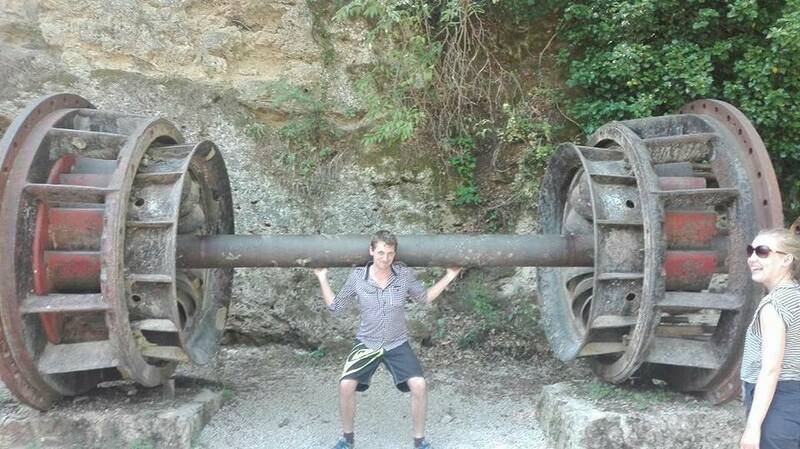 In 1895 he built the hydroelectric power plant on the river Krka, based on the work of Nikola Tesla (a local guy!! ), using Tesla’s AC system patent. It was the first of its kind in Croatia and Europe. It was set in operation on 28 August 1895, at 20:00, two days after the famous Adams Power Plant on the Niagara Falls. The same evening hydroelectric plant “Krka” began supplying power to the street lights in Šibenik, making it the first city in the world with street lights powered by a alternating current (AC). During World War II power plant “Krka” was heavily damaged. Due to the historical significance, the former Krka hydroelectric plant is protected as a monument of industrial architecture. Gecko tour’s guest takes the strain! Our man Boris in full flow!